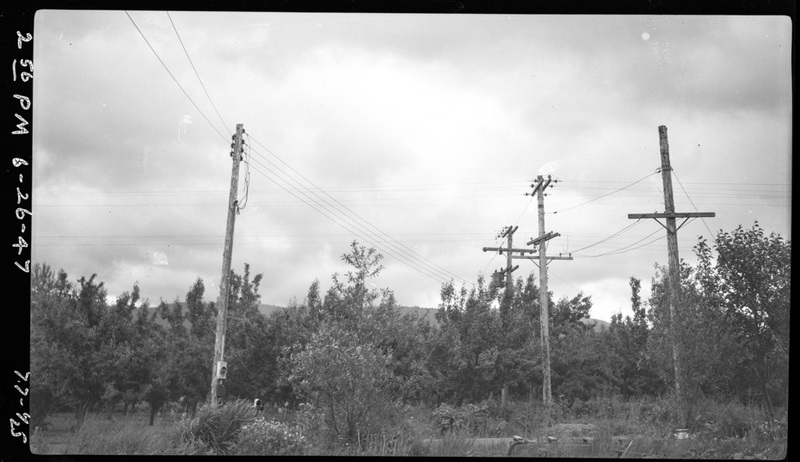 I've joked many times about the fact that a substantial portion of the Alva Day collection is photographs of power poles, but I'm not sure I've shared any. While I am grateful for the 2500 negatives we have from Mr. Day, I'll admit I wish there were a few less like this. Even so, we preserve them with the hope someone, someday might find them useful. If someone comes looking for information on how hookups to irrigation water looked in 1947, I'll be ready with an answer. Lower orchard, pumped right out of our creek. I don't remember, but maybe there might have been one pole in the vicinity of the orchard pump. See a milk can sitting out next to the road, so someone must have had cows. I don't miss the days of this many overhead wires. I am quite happy ours run underground to the house. Perhaps one day we'll have a display of utility poles at the museum for kids who've never seen one.